Based on human nature and history it’s undeniable that men aren’t perfect and they live together with crimes beyond memory – may they be violence, murder or verbal humiliation. Sins are thrilling, either they are our own or those of others. We can be coward or brave, we may love the excitement of detective stories – we are safe during dangerous situations and we can solve cases together with handsome detectives. In the course of the adventures we go through the most complicated labyrinths of human violence and tragedies, and at the same time we can guess who is the culprit, and we know that in the end the detective catches the criminal – with our without us – and we can learn from the cases. Whether we find out the whodunit or not, reading detective stories gives the experience of success. It is not just reading, it gives work for the brain and rewards one with the joy of new emotions, thoughts and morals. 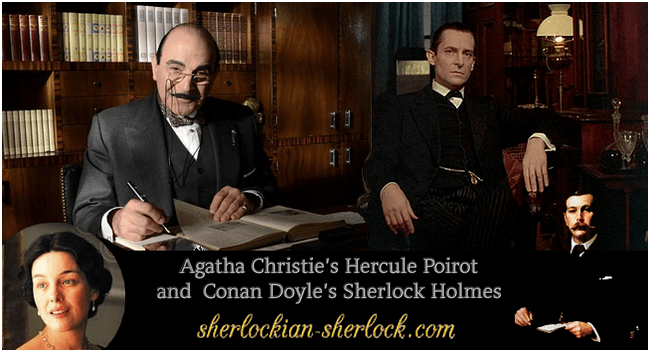 So mysteries are enjoyable for almost every age-group and it is usually easy to adapt them to screen – thanks to this we can enjoy the gorgeous Jeremy Brett as Sherlock Holmes or the phenomenal David Suchet as Hercule Poirot. The detective story as a genre was born thanks to an eccentric American genius, Edgar Allan Poe (1809-1849), who had fantastic imagination. He wrote strange, sometimes even morbid stories, and he created a unique hero, C. Auguste Dupin (You can read more about this detective here: Dupin, the predecessor of Holmes). The character has a brilliant mind, and he can be compared to the original, canonical Sherlock Holmes. Poe’s opinion was that the author is supposed to communicate things briefly, but has to pay attention to the smallest details and to every thoughts and emotions. He was such a master of words that the stories came to life in the imagination of the readers. The talented writer contributed to the boost of science fiction, gothic fiction and romanticism as well. No wonder that he soon became well-known and he is still very popular nowadays. „Poe’s stories are the roots of a new kind of literature….Detective stories were unnoticed and unimportant till Poe breathed new life to them.” – no one but Conan Doyle (1859-1930) told this, another literary genius, who always acknowledged the work of his predecessor. He admitted proudly that he was impressed by Poe’s mystery stories. For me it is indisputable that Doyle was an excellent, outstanding artist, there are several proofs for this. One of them is the fact that he could fully and whole-heartedly appreciate the works of others and he also respected his colleagues. Poe’s stories inspired him, but he didn’t ape them. Conan created his own unique characters and twisty stories, and he gladly voiced his opinion on the American author. Later Agatha Christie penned in her autobiography how the Sherlock Holmes stories gave her inspiration during her career. Doyle’s world famous creation, Sherlock Holmes is the most well-known sleuth, he is the king of detectives. But the prince of detectives is surely Hercule Poirot, the hero of Agatha Christie (1890-1976), whose adventures were as popular as those of Holmes published originally in The Strand Magazine, or as Poe’s mysteries. When speaking about detective stories, we have to mention Edgar Allan Poe, Sir Arthur Conan Doyle and the „Queen of Crime”, Agatha Christie – they are all brilliant masters of the genre. They are prolific authors who could write in other genres as well, and these other works also stand the test of time. As long as people live on Earth their name will endure, because their stories keep on entertaining countless readers. We told that people were always interested in crimes, this goes for Doyle and Christie as well. Their excitement was heightened when they got in touch with poisons. Conan attended medical university, where he often investigated harmful compounds. One of his lecturers was Sir Robert Christison, the renowned toxicologist. It is said that sometimes he swallowed mixtures to check their effects. It is true that another lecturer, the outstanding surgeon, dr. Joseph Bell (Recommended article: Dr. Joseph Bell) was the main inspiration for the figure of Sherlock Holmes, but we also find Christison’s curiosity and steadfastness in him. Just remember the adventure of The Devil’s Foot, where Sherlock tests the strange powder on himself and Watson. Agatha Christie was a nurse in a hospital, and later she worked in a dispensary. It happened at the latter place that she decided to write about murders done with poisons that are investigated by a detective. So we can say that both Holmes and Poirot were born among poisons. Yet it is true that their creators did not succeed for a while to find publishers to the stories, but they never gave up hope and finally Great Britain and the whole world welcomed these new crime-solving geniuses. Sherlock Holmes and Hercule Poirot were foredoomed to success immediately. Their stories were clear, believable and exciting. People stuffed themselves with the adventures and they regarded them as riddles. It became fashionable to talk about the murders and thefts these sleuths solved. For their fans they weren’t fictional characters any more, they were real, smart friends. They are the symbols of thinking, who raised the hope that there have always been and will always be clever people – and what is more, every reader can be similar to them, we only have to use their methods. They proved that using our brains can make the world a better place, as they did it with catching criminals. Both masterminds have their own faithful companions and helpers, Watson and Hastings, and these friendships mean a lot to the sleuths. In the course of the adventures their lonesome and eccentric personality improves – several hints reveal that they love nature and have an excellent sense of humour. These are appealing features. So many people thirsted for new stories that the authors kept on writing adventures even when it was an encumbrence for them. Both characters became well-known without the medium of television or the internet, and they didn’t need handsome actors to popularize them. Their extravagant personality and the ability to solve the most complex cases made them world famous. Their notoriety began in an era when it was much harder to become popular. And to top it all, their popularity was truly permanent – it lasts in our modern days as well. The looks of Agatha Christie’s detective differs from Sherlock’s appearance. While Holmes is a tall, clean-shaven, angular-faced, thin Englishman, Hercule Poirot is a shorter, moustached, oval-faced, tun-bellied Belgian. The Baker Street genius has French ancestors, whereas Poirot likes to use French words to show that he is not English, but he resents when people think that he is French. They both have dark hair and they are always elegant. Watson tells us that Sherlock’s face and stature are awe-inspiring. A nurse, Amy Leatheran describes Poirot as follows: „He looks like a hairdresser in a low comedy.” Hercule rinses his hair to keep it dark and he waxes his moustache. Doyle’s hero starts his career in his early thirties. He doesn’t have enough money yet to pay the rent of a whole two-storeyed flat, so he asks the young, indigent army doctor, John Watson to be his flatmate. The doctor doesn’t know anything about Sherlock’s profession when he agrees to move in together, but he gladly joins the investigations. Holmes is the first consulting detective, he is not committed to any authorities, yet he can work together with them. But he is much more efficient than the police, because he uses and combines different methods from various branches of science. He proudly states that he created his own profession. Conan Doyle’s character begins to work when he is young, while Christie’s Poirot is old at the beginning of his career. Both give hope, because their stories prove that age doesn’t matter when you want to make a living. It is very important, because there were people in every age who could not achieve what they want. For them hope and the success these fictional detectives gained are extremely important (You can read more about how the Baker Street sleuth gives hope in our article I believe in Sherlock Holmes.). Sherlock Holmes is a British symbol who lives at Baker Street, London. Agatha Christie was sure that Poirot has to live in this large city as well. Its first reason is that she was British and knew London very well, the second is that this way the scenes were familiar to many of her readers, and the third is that lots of crimes were committed in London. It is densely populated and busy. In Doyle’s stories Sherlock says Moriarty is a spider waiting for prey, sitting in the middle of its cobweb, controlling its surroundings. Under such conditions crime investigators have to be tough and effective as well. That is why Holmes and Poirot live in London – they know the city as the back of their hand, their clients reach them easily and they have access to lots of information. These heroes are lonesome geniuses. Friends, acquaintances and faithful servants appear in their lives, but most of their time they live alone, without relatives and partners. They live for their profession, though they have some hobbies as well. Both meet a significant woman: Holmes tries to outsmart the American singer, Irene Adler, while Poirot confronts the Russian countess, Vera Rossakoff. The resourcefulness and intrepidity of these ladies impresses the detectives, but there’s no romance. But why do we need romance in a detective story? Mysteries are great because of the investigations. A courting Holmes or Poirot would not have had time to practice his abilities or solving crimes at all. They are both living lonely, yet they are likeable, and just like Conan Doyle, they are elegant gentlemen. And if you want a charming lady, there’s Agatha Christie. Almost every people experiences sexuality, and many can write about it. Creating crimes with lots of characters and to put it into enjoyable form is a much greater task.